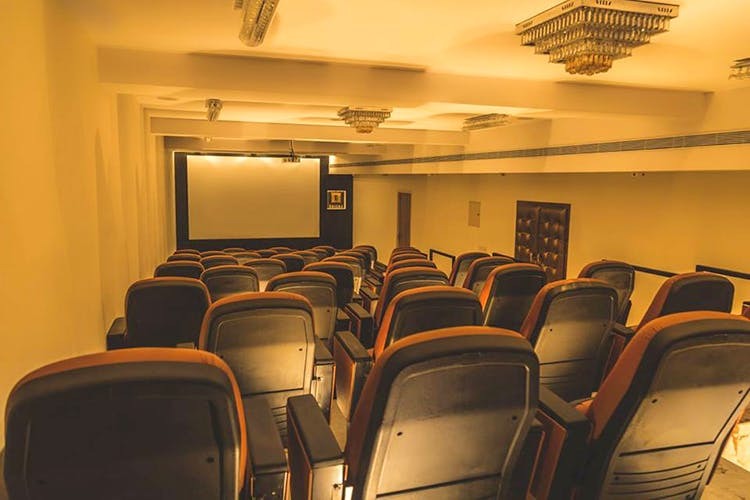 Erisha Auditorium in Kandanchavadi OMR is a mini-auditorium that’s been started to host small-scale events like photo shoots, match screenings and anything that will need a crowd of less than 60. The auditorium has a stage in the front, with seating for 57 people facing it. The stage is well lit, with soft brown light from all sides and has a plug and play, high definition LED projector at the back. The seating area has thick cushioned seats similar to theatre seats, so they can’t be moved. The layout of the space makes it conducive for events where there’s an act or a presentation on stage being watched by an audience, such as seminars, briefings, screenings and training sessions. The stage is well lit with multi-directional light and has been hired for photo-shoots and product launches in the past as well. Along with the main auditorium is a plush mini-lounge for smaller meetings and quieter interactions. The overall beige colour of the auditorium makes it feel warm and cosy. Speaking of temperature, there’s central air conditioning, along with basic amenities like Wi-Fi and clean restrooms. One of the other notable mentions about the auditorium is the acoustics, sound from the stage carries well to all parts of the seating, making it easy to address a full house without a mic. We think it’ll be a good place to host jam sessions and gigs too! Having said that, save for peripherals such as the projector and power sockets, you’ll have to bring your own if you want to use electronics. So that means cables, laptops, etc. The auditorium was meant for small-scale events and that’s reflected in their pricing as well. Six hours rent of the auditorium costs INR 10,000 and 24 hours costs INR 15,000, plus GST and there is an INR 15 charge per unit of electricity. For things like match screenings for football games, just charging each entry INR 200 solves your rent problems and you are left with an awesome place to watch games!